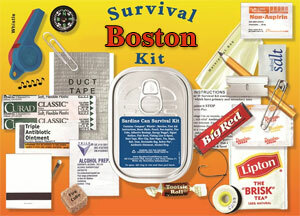 The Boston Survival Kit contains more than two-dozen first-aid, rescue, and safety items, all enclosed in a waterproof, crushproof, pocket-sized sardine can that fits right in your back pocket. Each kit includes: compass, whistle, matches, first aid instructions, razor blade, pencil, non-aspirin, fire cube, adhesive bandage, energy nugget, signal surface, fish hook, fishing line & spool, duct tape, wire clip, note paper, tea, sugar, salt, gum reclosable bag, safety pin, antibiotic ointment, alcohol prep. Dimensions: 4 /14" x 3" x 1".